We got two back-to-back episodes of Brooklyn Nine-Nine this week and the team had all sorts of fun and intrigue in this hour-long special. Let’s get to it, shall we? The 28th Annual Tri-State Police Officers Convention, otherwise known as “Cop Con,” is happening in Rochester, and the whole team is pumped and ready to go. There’s nifty tech gadgets to try out and police parties to crash. But Captain Holt tells them they must be on their best behavior. He knows Rochester is a great place to visit (it even has a thermometer museum! ), but having only just recently survived being shut down, he doesn’t want their precinct to raise any eyebrows. Plus, he’s up for a seat on the board of directors for the convention and doesn’t want the behavior of his team to jeopardize his chances. They begrudgingly agree, but after he’s left the room Jake says he’s an expert on sneaking into parties without parents (in this case Captain Holt) finding out. He’s not an expert and no one believes that he is but they are all about having a good time behind Holt’s back. Once they arrive at the conference, the team takes off to check out the cool tech and Scully runs into the female version of himself, Cindy Schatz. It’s love at first sight for both of them. Meanwhile, Captain Holt runs into the worst person he’s ever met, the “living embodiment of evil,” Captain Jeffrey Bouché, who gleefully tells Holt that he too is running for the open board of directors seat. When Terry asks why Holt hates the rather jolly Bouché so much, Holt says he’s been up for promotions against him on six separate occasions and Bouché has won each time because he’s a snake. Terry speculates that perhaps Bouché wins because he’s just a really nice guy but Holt remains adamant that it’s all an act. Later that evening, the teams waits until Holt is tucked in for the night and then heads out to party. Unfortunately, the party organizers — the Buffalo Police Department — are being led out in handcuffs when they get to their room. It seems the BPD was caught taking bribes. Jake says no worries, the Nine-Nine will throw the party instead and it will be epic. The team gets a bunch of the cool tech from the conference to make their party even more epic. Jake sets up the patrol robot that was on display at the conference outside of Holt’s room and programs it to send him a text if Holt leaves. All the party-goers are having a great time when suddenly a text comes through. Holt is on the move! They manage to clear the hallway and hide everyone in their rooms just as Holt walks through. Holt knocks on Jake’s door and Jake opens it just a crack so as not to reveal all of the many people crammed in the room, waiting to resume partying. It turns out Holt is just concerned about his presentation tomorrow. Bouché has so much more jazz, he says, and he’d like Terry to look over his presentation and see if he can make it look a little better — maybe even add some color. Jake says sure thing, and Holt hands over his laptop. Jake shuts the door, waits for the all-clear from the patrol robot, and then everyone starts partying again. The next morning everyone’s still passed out from last night’s craziness when Holt knocks on Jake’s door again. It’s 11 a.m. and Holt wants his laptop back so he can look over the changes Terry made and make sure he’s prepared for the presentation. Two small problems: Terry never made the changes and the laptop is missing. They manage to stall Holt by sending a very hungover Rosa to work out with him (to clear his head before the presentation) while Jake, Amy, Terry, and Boyle search the entire hotel. They have 90 minutes to find the laptop before Holt has to present. As they search, they start to have flashbacks from the previous night, which leads them to remember Jake catching on fire after Terry set off a firework and Boyle murdering the robot in a jealous rage. They realize the robot had a camera and review the footage and see Boyle leaving the laptop bag behind a potted plant. The laptop is still there! Meanwhile, Amy and Gina decide to help Scully land his dream woman, Cindy Schatz. They give him an earpiece and hang out nearby, whispering in the mic everything he should say. They give him some great lines but Cindy rejects him and walks away. Terry and Jake race up to Holt with his laptop. As an excuse for not making the changes, Terry says he decided the presentation looked best in its original black-and-white. Holt heads to his presentation but something is very, very wrong. His presentation has been replaced with a series of photos from the party last night which shows the members of the Nine-Nine in all their drunken glory. Terry and Jake, who are watching from the back, are horrified. Just as they’re asking each other who could have taken the photos, Jeffrey Bouché walks up and happily takes full responsibility. Turns out Bouché is just as much of a snake as Holt said he was. Holt lets the team know about his extreme disappointment in them and says he regrets even coming to Rochester. After he leaves, Scully bursts into tears but tells them all it’s not because of Holt’s lecture, it’s because he’s unlovable. Amy and Gina decide to have a little chat with Cindy to find out what happened. Apparently, she really liked Scully when he was awkward but then “confident Scully” showed up and she didn’t like that guy. Amy and Gina realize their perfect whispered lines were not the right things for this lady. They run off to get Scully and just let him be his awkward self. They hit it off great. Jake heads to Holt’s room to apologize for the team but Holt tells him what really upset him the most is that the team looked so happy — without him. Holt tell Jake all he wants was to be at the party instead of stressing out over his presentation. To make it up to him, Jake and the team take Holt to the Rochester thermometer museum. They all have a fantastic time and even get a picture together — the whole team this time. In the second episode of the night, Amy is preparing to take the Sergeants exam. She normally loves tests but she’s super stressed about this one because it’s always been her life’s goal to be the youngest captain in the history of the NYPD. If she doesn’t pass the Sergeants exam on her first try, she’ll have to wait another three years to take it, and that will disrupt her whole life calendar (which hangs above her bed). 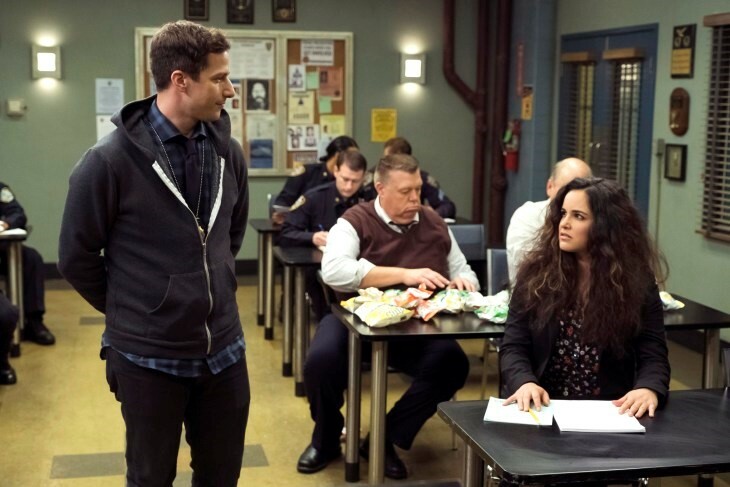 As Jake explains to Rosa and Boyle what’s been bothering her, Amy suddenly starts screaming at the microwave in the precinct kitchen for taking too long to cook her oatmeal. She throws the microwave to the ground and begins beating it with her police baton. So, yeah... just a little stressed. To help Amy out, Jake sets up a practice exam for her. Amy usually shuns practice exams because the conditions are too pristine to give accurate results, but Jake brings in a dozen or so officers to be distracting so that Amy can practice in the worst of conditions. She thanks him and settles in to take the two-hour practice exam. Unfortunately, the practice test has the opposite effect Jake was hoping for. A freaked out Amy leaves Scully with a note for Jake saying she’s decided she can’t take the real exam anymore and disappears. With only three hours left before the exam, Jake and Rosa set out to track her down and bring her back in time. Jake tries calling her from Terry’s phone because he knows she’ll never turn down a call from a superior officer. But they discover she’s left her phone, wallet, keys, and purse in her desk drawer. Rosa suggests Jake treat Amy like a perp instead of his girlfriend and put himself in her shoes. So, they take off down the street with Jake trying to think like Amy. Meanwhile, Terry has let Captain Holt know he doesn’t think they have enough toys for children in the precinct. After all, sometimes they have the children of witnesses there and they should have something to play with. In fact, there’s a witness and her child coming in later that day. Holt is dubious but finally agrees to help Terry build a model train set that will keep children entertained. Unfortunately, Holt and Terry disagree on how a model train set should be built. Terry believes in fun and imagination while Holt believes in accuracy down to the very smallest detail. While Terry’s distracted, Holt throws away his “sombrero restaurant.” Terry discovers the betrayal and this leads to a bet between them: they’ll each build their own version of the train set and see which the witness’s child prefers. But when the child arrives, he thinks all trains are lame and just wants some video games. Sadly, Terry sets up a video game system. He and Holt decide to set their differences aside in the name of a shared love of trains and proceed to play with the sets themselves. Boyle and Gina are in the midst of their own feud. Boyle’s grandmother died and left her most prized possession — the “mother dough” — to Gina. The mother dough is the Boyle family’s sourdough starter and it’s been in the family for 140 years. Boyle, an extreme foodie and amateur chef, is insanely jealous that Gina, who barely even knew his grandmother, received this priceless gift. He thinks their grandmother must have meant to leave it for his cousin Tina and got confused. Gina, who couldn’t care less about any of this, says she’ll give Boyle the mother dough for $10,000. It takes him all morning but he manages to scrape together the cash. Unfortunately, in the time it took him to gather the money, Gina’s space heater burnt the mother dough to a crisp and now it’s nothing more than a charred ball. Soon Boyle gets a call from his cousin Tina, who shows up at the precinct with another cousin and an officer of the court to contest the will. Gina tells them right away that she destroyed the mother dough and they banish both her and Boyle from the family. Gina doesn’t care but Boyle is crushed. Gina decides to create a new mother dough and calls the cousins back. She tells them that even though it’s not the same as the Boyle Mother Dough, she will love it and care for it and soon it will be just as wonderful as the original was — as long as they un-banish Boyle. They agree. Back on the streets, Rosa and Jake are having some success tracking Amy. They’ve used their master sleuthing skills to discover she went to the library and from there ordered a car service that took her to the Department of Records. But there they encountered a dead in. She signed in 20 minutes ago but her friend Kylie, who works in the building, hasn’t seen her and isn’t the biggest fan of Jake. She finally begrudgingly agrees to help and looks up which file Amy accessed. Jake realizes the file was the case they were working together when they developed feelings for each other. He finds her on the rooftop they had celebrated on after solving it. Amy explains that she didn’t run off because she failed the practice exam. In fact, she got 102% (she gave herself extra credit for finding a spelling error). She ran because she’s afraid once she becomes a sergeant everything will change between them because she could get transferred or become Jake’s boss. He tells her she can’t be afraid to be successful. The pep talk works but when they go to leave the roof, they realize the door is locked. The exam is in 20 minutes and Jake says he’ll do whatever it takes to get her there on time. He tries to rappel off the roof using a fire hose but only ends up getting stuck halfway down and hitting his face on some window bars. Fortunately, Rosa comes looking for them and tells Amy to go take her test while she helps Jake out of his predicament. Amy, of course, passes her test with 45 minutes to spare.